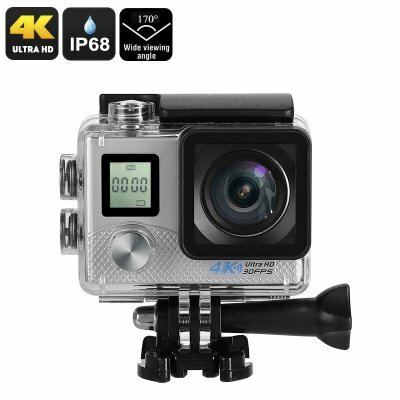 Successfully Added 4K Sports Action Camera - 4K Video, 16MP Photo, Sony 16MP 1/3.2-Inch CMOS Sensor, 170-Degree Lens, IP68, WiFi (Silver) to your Shopping Cart. Capture breathtaking 4K video and 16MP pictures during upcoming holidays and sports events with this compact 4K sports action camera. This remarkable gizmo features an extremely compact size, allowing you to easily carry it along anywhere you go. Coming with an abundance of clips and hooks, this sports action camera can be easily attached to your helmet, bike, or other equipment. The sports camera furthermore comes with an IP68 waterproof case. This protects your gadget against drops and dust and is waterproof up to depths of 30 meters. Therefore, you’ll be able to take your sports action camera along anywhere you go without needing to worry about accidentally breaking it. This 4K action camera comes equipped with a state of the art 1/3.2-Inch 16MP CMOS sensor from Sony. Thanks to this, it allows you to shoot mesmerizing 16MP photographs and 4K video at 30fps. With a recording angle for 170-degrees and 4x digital zoom, this sports action camera allows you to capture anything in great detail. The gizmo furthermore treats you to different recording modes to make sure it will meet your demands no matter the environment. By allowing you to slide in a 32GB SD card, you can be guaranteed the action camera offers plenty of space for you to store your pictures and recordings. It furthermore comes with APP support on both iOS and Android phones and supports WiFi. This makes it easy to instantly share your recordings into your smartphone. With a 1050mAh battery, this sports action camera lets you shoot video for up to 80 minutes straight, all of which can be reviewed easily on the camera’s 2-Inch LCD display. This sports action camera comes with a 12 months warranty, brought to you by the leader in electronic devices as well as wholesale sports cameras..